We haven’t done one of these in a very, very long time. I recently stumbled upon a cache of old photos that I took in the summer of 2006–in the nascent days of this blog–on a trip back to my home state of Rhode Island to capture some of the retail oddities of my home region. Ann & Hope was one of the most storied retailers in New England during their reign from the 50s until 2001, and is most famously known as the pioneer of discount department store retail. Legend has it that Sam Walton modeled Walmart after their concept. Ann & Hope was founded by Martin Chase, a Ukrainian immigrant who moved to Providence, Rhode Island when he was six years old. He spent much of his young adulthood working at various clothing retailers, before starting his own store, Chase Clothes, in the 1930s. Chase minimized overhead by using inexpensive store fixtures and not offering frills such as alterations. In the mid-1940s, as the clothing market was depressed due to World War II, Chase began to look at new business ventures to expand into, and he purchased the sprawling Ann & Hope mill complex, named for a ship lost at sea off the coast of Rhode Island in 1806. The mills were located in Cumberland, Rhode Island, just north of Providence. The Ann & Hope complex was made up of large, somewhat disused factory buildings, and Chase split the spaces up and rented them out piecemeal to subtenants and retailers. In 1953, one of the tenants moved out of the complex and left a large amount of ribbon behind in the mill, and Chase opened the space to the other tenants in the center to purchase the remnants. Inspired by his success, Chase decided to reopen his own retail venture in the space, and gradually expanded his retail operation within the complex. By the end of the 1960s, Ann & Hope had grown to a $40 million-a-year general merchandise business, and Walton’s famed visit occurred in 1961. Ann & Hope pioneered the discount department store concept, with centralized checkouts, large amounts of merchandise that customers could peruse without sales personnel, and shopping carts. 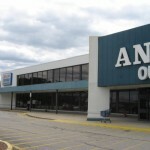 The original Ann & Hope mill location, which was located in oddly-sized rooms on different levels in an old industrial building, also featured shopping cart escalators and a large parking lot, both innovations at the time. 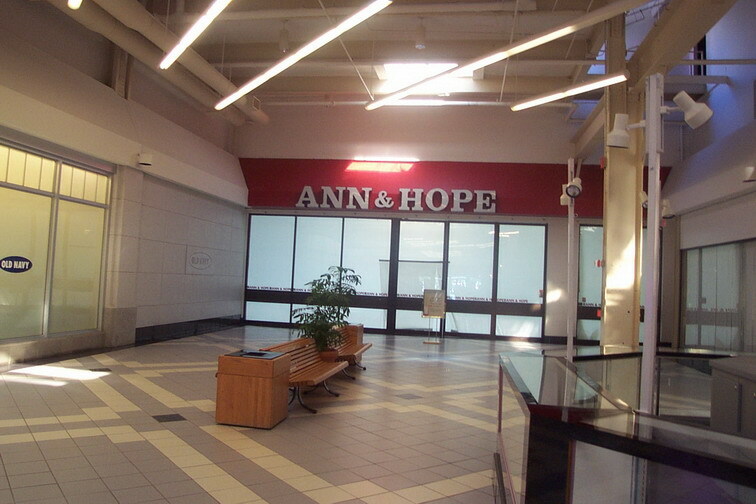 Ann & Hope stores also featured a full-service cafeteria and generally had several small sub-tenant spaces such as a flower shop or garden center in the front of the store. 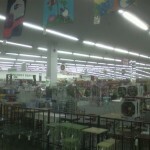 Ann & Hope stores typically sold a wide variety of merchandise, including a large grocery section, a wide range of apparel and home goods, as well as electronics, appliances, general merchandise, and more. They carried much of what you would get at a modern Sears or Best Buy, along with many of the softer goods you’d find at Target, all under one very massive roof. In addition to the original Cumberland location–which bore little physical resemblance to the modern big box store, the chain opened large (often over 200,000 square-foot) suburban-style stores throughout New England. 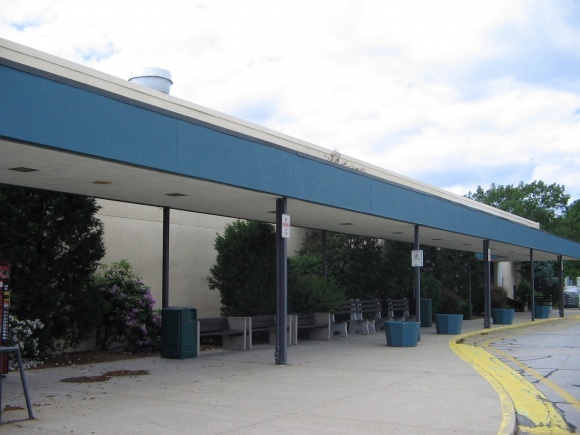 The other locations were in Warwick, Rhode Island; Seekonk, North Dartmouth, Randolph, Danvers, Watertown, and Methuen, Massachusetts. The Watertown and Danvers stores even anchored large regional malls, whereas the other locations were standalone. 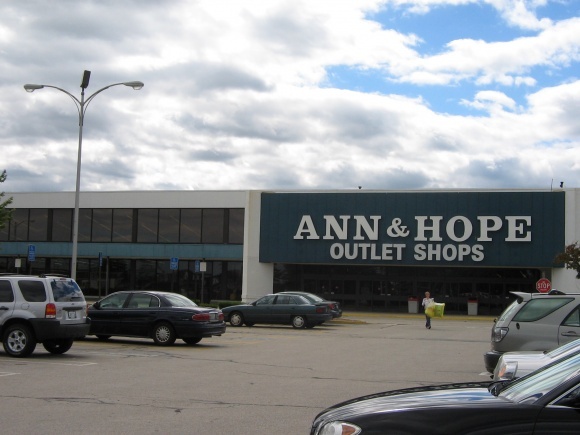 From the 60s to the 90s, Ann & Hope was a dominant retail force in New England, and many of their stores acted as regional draws much in the same way as malls did, anchoring their respective retail districts and attracting a flurry of commercial development–development that, in many cases, would ultimately spell their demise. In the spring of 2001, when the economy was weak but was especially struggling in New England, many regional discount chains such as Bradlees, Apex, and Ann & Hope finally found they were unable to compete with larger competitors. Many of these chains, such as Target and Walmart, were able to use the leverage of operating many locations in less-expensive regions of the country to offset the high-cost stores in New England, whereas smaller chains like Ann & Hope simply didn’t have the leverage or buying power to stay on board. All of the store locations, save for the Warwick and Cumberland stores, were closed outright. 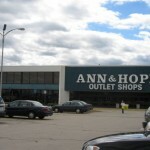 The remaining two stores were converted to “Curtain and Bath Outlets,” focusing on a few key areas of Ann & Hope’s offering (along with lawn and garden), and a dramatically shrunken footprint. Much of the remainder of the Warwick store even served temporary as the headquarters for Brooks Pharmacy, while their own offices were under construction a few miles away in East Greenwich. The Curtain and Bath Outlet seems strange–and the appeal seems to be primarily to older women–but has proven so successful that the still-surviving chain has opened a total of 11 stores under this new format. 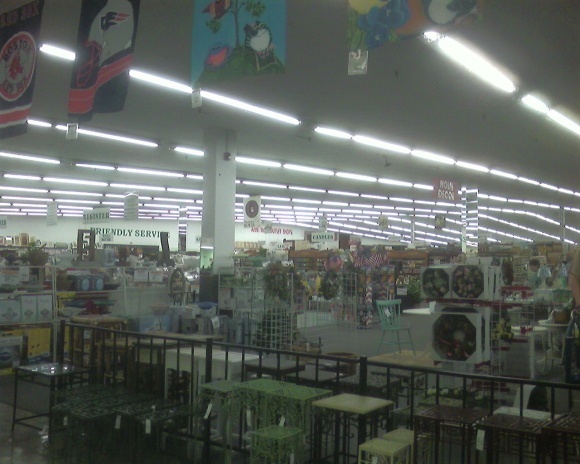 These photos were taken in summer 2006, approximately five years after the closure of this location as a full-service Ann & Hope store. The exterior of the building is largely unchanged from pre-2001, except for the addition of the ugly “OUTLET STORES” sign below the main A&H signage. The Curtain and Bath concept was operating, however, hence why I was able to get inside and snap a few quick pictures, but it’s important to note that this bears very little resemblance to the original Ann & Hope, which was significantly more comparable to a higher-end Walmart Supercenter or the hypermarket chains like Meijer, Fred Meyer, or Bigg’s. I enjoyed this post. My mother dropped out of Pilgrim High School to work at Ann & Hope when she was 16. Her family was dirt poor and they needed the money. Anyway, despite the sorry circumstances she has fond memories of the store, and apparently the pay wasn’t bad. There really was nothing else like it around at the time. I’m also amused that you didn’t include Caldor in your list of defunct New England retail chains! Another semi-successful hypermarket venture was Auchan, which eventually opened up to 2 stores in Houston and closed in 2003. 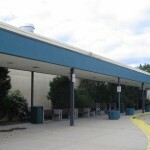 The commercials were catchy and showed the large-ness of the stores: “Everything you need and most everything you want”. 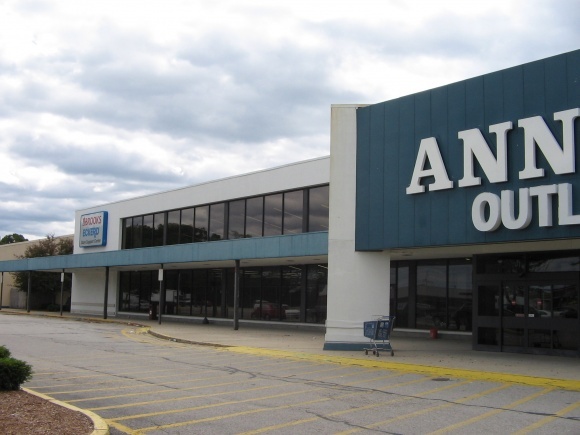 But I’m concerned that Ann & Hope was more like one of the early discounters that didn’t quite get supermarkets right, like the “Korvette City” complexes or Two Guys. Did they really keep supermarkets up until their demise? is a picture of a mall A&H storefront (closed, of course). It later became Linens N Things (the mall side, most of it became Home Depot), which means the storefront is empty again. In addendum to my above post, I’d like to request a spotlight on Lechmere: that sounded like a neat store. @Pseudo3D, or even a “Labelscar namesake”: a look back at CALDOR or PRANGE WAY. @Pseudo3D, To add the Prange Way mention, being a native (and still living here) WI resident, that chain bears many childhood memories. They were, after all, one of the anchor stores to my hometown mall. I have to get some more information, and locations down, but otherwise the history of that chain and its flagship H.C. Prange Co. were once a major player here. At least up until the mid 1990s, when they fell into financial troubles. They had huge plans set up in early 1995 to open small-format (think Pamida) stores and also ‘Supercenter’ format locations. Never came to fruition. Personally I’m wanting to make a site based around WI, Upper Michigan and Northern IL retail, with info on nearly every enclosed mall that Wisconsin’s had……from the first fully-enclosed center, Valley Fair (in the Appleton area), up through the last enclosed mall to be built/expanded, Paradise Mall (which was in West Bend WI) It’s a huge undertaking of course, so it would take lots of time. Oddly, in the Site Map, many Wisconsin malls are listed, but with no hyperlinks. 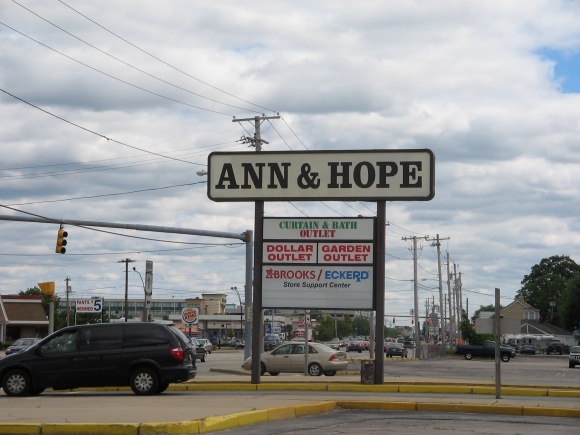 ANN & HOPE is just one of many defunct New England stores. That also includes LECHMERE’S. I worked at the Warwick store the summer of 1987, just before I went to college. They were doing some renovations to the store at the time, and hired a handful of 16-18 year olds for extra help. It paid $4.25/hour, which was above the state minimum wage at the time, and well above the federal one. The benefits for employees that got past the 90-day mark were pretty good, if I remember correctly. The employees – including management, all seemed pretty nice. At that point, some other stores (Caldor, for example) had started to move in – and I remember some of the long-time employees complaining that management was continuing the old two or three color ink-drawn newspaper inserts that Ann & Hope had always used, instead of switching to full-color inserts. One of the big draws in the late spring and summer was the gardening / landscaping department. It was huge, mostly outdoors, up at the south end of the store. You could get everything from small gardening stuff to large shrubs, etc. Ann & Hope – and Apex, another local store chain now gone, were fantastic for Black Friday shopping. Benny’s seems to have done OK – they’re still around. I loved ann & Hhope (warwick) I remember as far back as when I could ride the motorized horse at the front door for 10 cents a ride. The little caferteria was great too. This is where my parents went for schools clothes to curtains to televisions. Apex was also a very great store!